December 8, 2018 — On a chilly Saturday morning with a mist of hoarfrost in the air, Nimbus was ceremoniously lofted over Nicollet and permanently sited in the forecourt of Minneapolis Central Library. 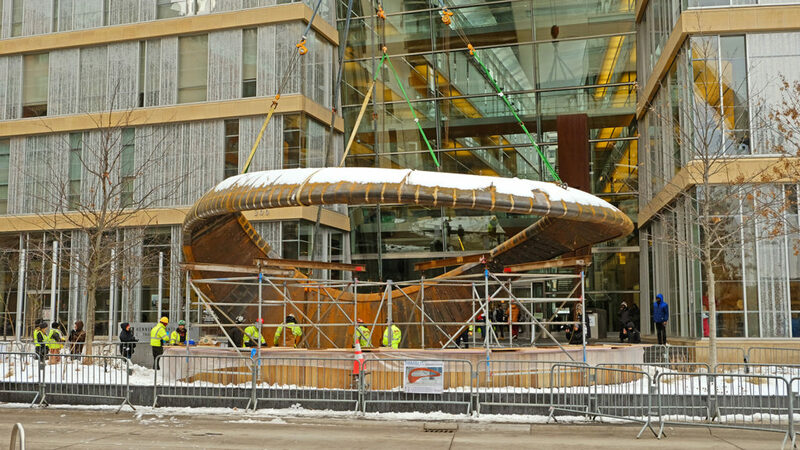 The colossal sculpture by Tristan Al-Haddad, three-years in the works, completes the collection of public art on Nicollet. For the past month, the public watched as the sculpture, trucked from Al-Haddad’s studio in Atlanta, Georgia in seven parts, was assembled in a parking lot across the street. Then a crowd gathered with Al-Haddad’s team to watch the big moment when Rocket Crane settled it carefully into place. 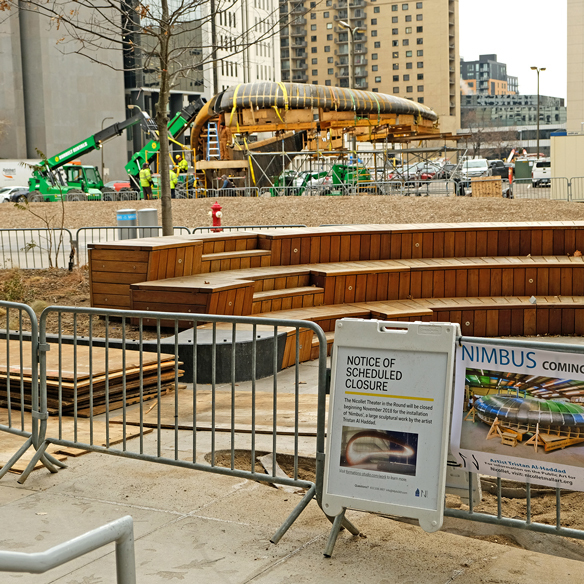 On November 9, 2018, Nimbus arrived in Minneapolis after its trip from artist Tristan Al-Haddad’s fabrication studio in Atlanta, Georgia. Shipped on two 14-foot-wide by 53-foot-long flat-bed trucks covered with tarps, the sculpture was delivered in eight sections. Nimbus packed up to leave Atlanta on November 7, 2018 and arriving in Minneapolis at sunrise on November 9, 2018. During the past month, the sculpture has been staged and assembled in a parking lot across from Central Library. 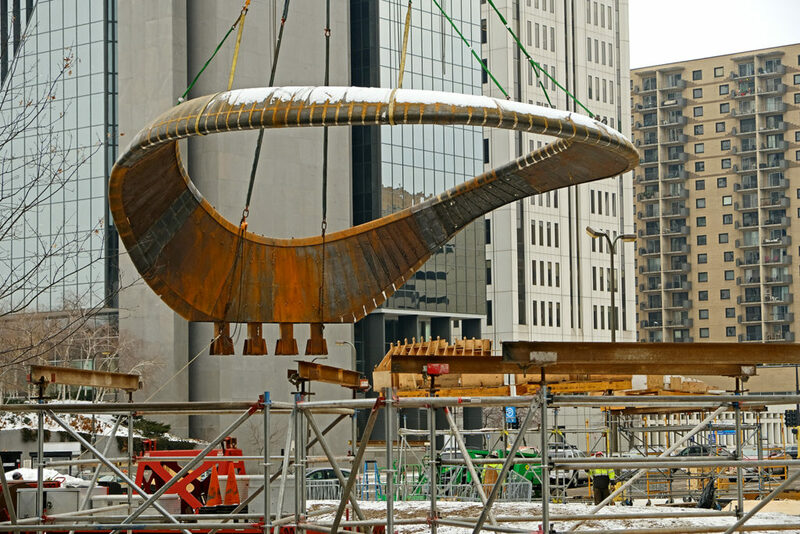 On December 8, 2018, the sculpture will be lifted over Nicollet by a giant crane and installed in the forecourt of the library, completing an ensemble with the Theater in the Round. Al-Haddad and his team of welders and fabricators and Rocket Crane have been working in near-zero temperatures, rain, snow, and occasionally, sun, to assemble the work. What does it take to assemble the 18,000-pound sculpture? See progress in this photo essay. M Kulka on Nimbus Has Landed!